There are several Webkinz events and sales going on right now related to Wacky Zingoz because of the Webkinz Wacky Zingoz Celebration that runs until Sunday, August 12th. There are also special Wacky themed prizes. Some of the information and pictures in this post are taken from other posts on here or from posts on Webkinz Newz. The only event or prize available on the Webkinz app is the floating Wacky Lemon Ice Pops. However, the Ganz eStore can also be accessed from a mobile device. Webkinz Players can look for floating Wacky Lemon Ice Pops until Sunday, August 12th. Regular Webkinz Members can receive five Wacky Lemon Ice Pops a day and Deluxe Members can receive eight Wacky Lemon Ice Pops a day (numbers are per Webkinz account).The Wacky Lemon Ice Pops are needed for the Wacky Challenge and can be found floating on the Webkinz website and on the app. They also sometimes reward a Wacky Go Kart as a prize after being fed to your Webkinz. There are new prizes available that players will receive when they score more than 11,500 points in WackyER Zingoz. These prizes will be available until Sunday, August 12th and players will receive one prize each time they score more than 11,500 points. 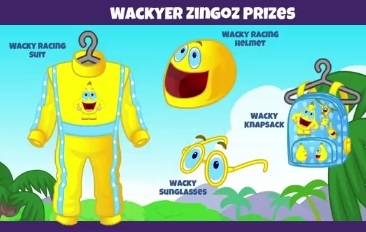 The new prizes include a Wacky Knapsack, Wacky Racing Helmet, Wacky Racing Suit, and Wacky Sunglasses. Players that hit Wacky 600 feet or more in a game of Wacky Zingoz during the Wacky Zingoz Celebration will also win a Master Blaster 600 Trophy. There is not a limit to how many trophies players can receive but the trophy is only available until Sunday, August 12th. The trophy can only be won by playing Wacky Zingoz in the Arcade on the Webkinz website. It is NOT available by playing Wacky Zingoz in the Tournament Arena. The Master Blaster 600 Trophy is NOT new because Webkinz has been alternating between the Master Blaster 600 Trophy and the Wacky Zingoz 600 Trophy for the Wacky Zingoz Celebration for the last several years. The Master Blaster 600 Trophy was released in 2014 and the Wacky Zingoz 600 Trophy was released in 2006. The next Webkinz Deluxe Day is Saturday, August 11th. 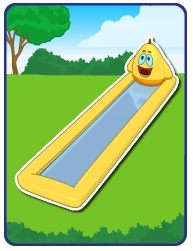 Deluxe Members will be able to receive a Wacky Slippy Slide from the Today’s Activities page on the Webkinz website. Webkinz players that purchase a three month or one year Deluxe membership through Thursday, August 16th, will also receive one box or three boxes of Wacky Lemon Ice Pops for “free” because they cost 3,000 eStore Points for regular members and 2,500 points for Deluxe members if people do not purchase a Deluxe Membership during this promotion. 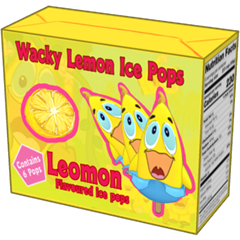 People that purchase a three month Deluxe membership will receive one box of Wacky Lemon Ice Pops and people that purchase a one year Deluxe membership will receive three boxes of the Wacky Lemon Ice Pops. Each box includes six Wacky Lemon Ice Pops. These are the same Wacky Lemon Ice Pops that have been floating since Wednesday, August 1st, and that will stop floating on Sunday, August 12th. 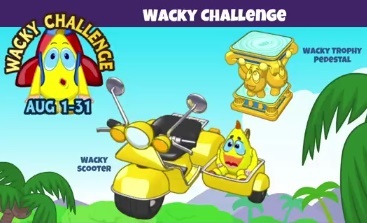 These Wacky Lemon Ice Pops can also be used to complete one of the tasks for the Wacky Challenge. The Ganz eStore also has some products available for purchase related to Wacky. The Boxes of Wacky Lemon Ice Pops and a Wacky’s Burger Stand are new items available. What are your favorite parts of the Wacky Zingoz Celebration? What tips do you have for playing Wacky Zingoz or WackyER Zingoz? What are your favorite prizes from playing the games or completing the challenge? 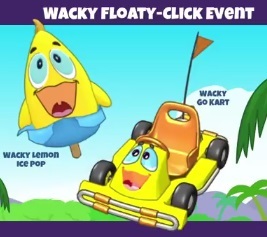 Have you won a Wacky Go Kart from feeding the Wacky Lemon Ice Pops to your Webkinz? Did you know that there are two different trophies for Wacky Zingoz and that Webkinz alternates which one can be won during the Wacky Zingoz Celebration? thank you patsie………..i did not know the pops were on a time limit, just the wacky prizes! is the master blaster 600 trophy new? I wish the wacky prizes were available the whole month (for playing WackyERZingoz! Too many activities in RL right now! I also didn’t realize that I couldn’t play Wacky ER Zingoz on my free accounts until tonight! Sigh! Good news! We will be picking up our daughter at the airport from her Spain trip tomorrow! On Friday we will head for our family reunion (my side of the family this time). I will be away for a week,but will try to keep up with all the WW newz if I can! Patsie.. thanks for the new post ! Didn’t realize there were 2 different trophies for the baster game ! Ganz must be paying it forward for all the gifts you have given all of us here on the blog ! Well deserved !! dee… hope you are enjoying your visit with dd !! QOS… I am sure you will be happy to have your dd home from her trip to Spain ! April… How are you doing ? Getting settled in your new home yet ?? Today is the first day with the new MA ! Have not met her yet but it should be interesting..to say the least… Stay tuned !!! moms.. Hope all is well with you ! I agree QofS…I wish those prizes would continue through the challenge too. Yep! Can’t wait to see my dd! Did I mention she has a girlfriend from Spain that is also coming? They have different flights, but the same destination. We are hoping that they make all their connecting flights today, otherwise it will be inconvenient for us. Also, I didn’t realize that the Sophie Dive Room prizes were not KP. I really hope that I get one of each on my main account. The most popular across the board for most of my accounts seem to be the columns and the Sunken Dining Hall Chair. Gaga – Hope all goes well with the new MA! Will be thinking of you, today! Well, off to clean bathrooms & vacuum carpets! Wacky Wednesday is very short for me today because of all the RL wackiness! LOL! QoS – thanks so much for the reminder about the dive room!!! hey gaga – i hope today was wonderful! Movers show up tomorrow. I can’t believe it’s here. I’m really sad to leave our home here, but life moves on. The truck will show up Monday to unload everything. I’m sure it will take me awhile get up and running. I feel like I’m losing my binky! LOL I love my big ole tower and monitor. But thankful for the phone. gaga—We drove up to WI to close on the house and came right back. Hope today went well with the new MA. I was able to get a go kart (Whoo Hoo) and finally got the wacky glasses, so I have one of each prize! That was my goal before the movers showed up. Big wave to everyone and see you in WI! Hope everyone has some wacky good luck this weekend! whose kid was in spain? was it mist? if so may i ask where and why? Mist I can’t thank you enough, you are the Best! Any idea the best way to find the floaties? I can’t just sit and do nothing. Thanks for the well wishes.. First day went well… She seems nice.. not her fault she is taking our job… Very busy procedure day today .. It is difficult to have someone velcroed to your scrubs !! April.. I know how difficult it is to leave a home you have loved.. memories..
starting over is so emotional… A new adventure and you can make new memories and hopefully get settled and make new friends… You always have us! Congrats Mist on winning the webkinz newz contest pet!! Exciting!!! I’m so happy for you! QoS- so far I’ve only gotten colunms and sunken dining chairs too from Sophie dive room. Although sometimes I go to visit that room and so many pets are crowded around Sophie that I can’t even click on her. Does this happen to anyone else or is it just me? It happens all time to me, and sometimes I think people are making it difficult on purpose. April – Take a pic of all of you in front of your old house. It make a nice memory. april – i hope the new adventure is happy & fulfilling!!! moms… thanks ! Hope you get a clean bill of health ! Checking out pre season football game… Hopefully CLE can will at least one game this season… Looks like we have some new talent who look promising ! Wacky Week has been fun … a little tired of WackyER.. very time consuming and am trying to get another wacky back pack… Will have a bit more time this weekend ! April.. good luck with your move on Monday… Must be very tough to pack up a home you love and start over…. Best wishes on your move, April! Momskinz – I have a physical coming up and I’m dreading it. Need to take off 5 more pounds. Hard to do with all the parties. LOL! Gaga – I was hoping to get another wacky back pack for my dear granddaughter, but I’m busy packing now for my trip. I got one for me and one for my daughter. I’m fine on all the other things. And the truth is, I’m not sure how much it means to my dgd anyway, so I’m letting it go. Dee – My dd went to Spain for the summer as an “au pair” and she also taught English to the boys she was caring for. This was her 2nd trip to Spain. Last fall she spent the semester there (in connection with her university) and lived with a different host family. She graduated this spring with a degree in Spanish. Update – My dd’s friend missed her connecting flight, SO my oldest dd & her husband picked them up in a city that is far away from us. SO….that means that I haven’t seen my dd yet. We are all meeting up this weekend to celebrate my parents’ 60th wedding anniversary. I may have told you all that. Then I will be spending the week with my parents. Have a wacky weekend everyone! Mine will be wacky in a different way! Missing Deluxe Day, but oh well. Will try to get it, but not sure I will have wifi connection. I’m hoping with the upcoming change to APP via web that this will be addressed. Lots to do, so bye for now. gaga – all is well – ekg, chest xray, etc. – see ya next year! dee.. Hope you are enjoying your time with your dd !!! Intriguing message at e store… Collectors… Look for ???? Sept 12 th… Looks like Sweet Tooth Tiger …. Hope all is well with everyone here !! Have a great day …. and enjoy the last few days of Wacky Fest ! QoS – I just played WackyER to get you an extra backpack – what’s your wwid so i can send it??? i scheduled a new post for when this one closes, so comment there once this closes!!! Question: Does anyone know how many cat outfit pieces we’ve received already? I think I only have the hat.